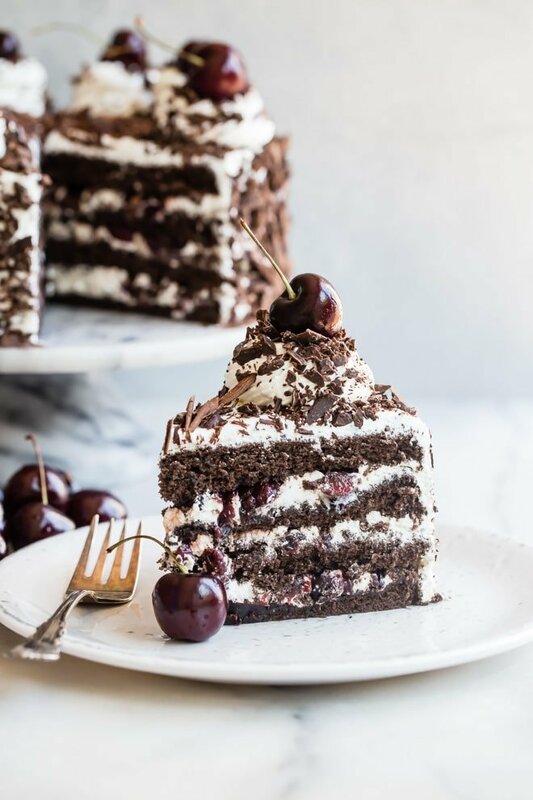 It doesn’t get any more spectacular than Black Forest Cake: luscious chocolate sponge cake layers brushed with cherry liqueur, filled with cherries, then covered in sweetened whipped cream and chocolate shavings. 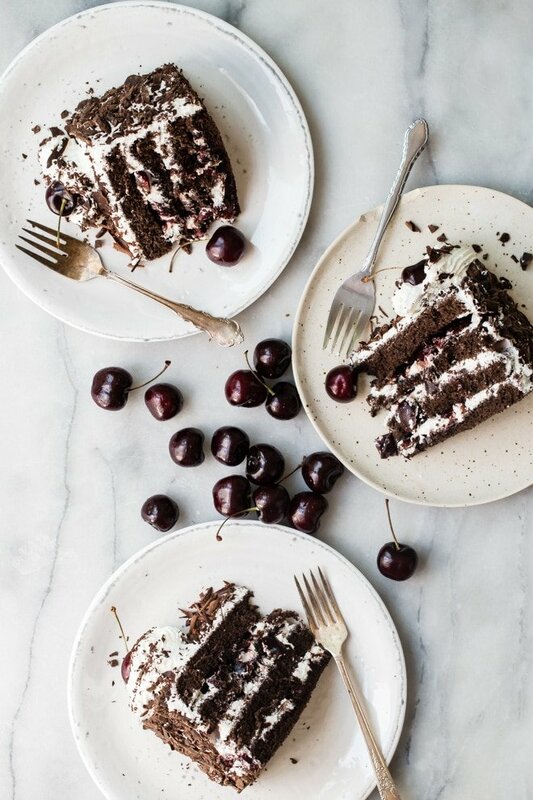 Most people just buy Black Forest Cake from a grocery store, but when you bake your own, you get to skip the candied maraschinos and make it just the way you’ve always wanted it, using fresh cherries, rich cocoa, and real whipped cream. Where does Black Forest Cake come from? A romantic cake that celebrates what Germans call “forest-loneliness,” some historians say that the cake got its name from the traditional costume worn by women in the Black Forest. The dress was black (like the chocolate), the blouse was white (like the cream), and the hat was festooned with red pom-poms that resemble the cherries. In German, the cake is called Schwarzwderkirschtorte which means Black Forest Cherry Torte. One thing is certain, you won’t be lonely if you make this cake; people will come out of the woodwork to score a piece! What is Black Forest Cake made of? 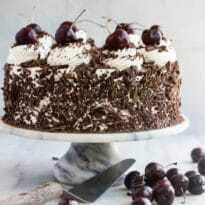 Traditionally, this cake uses four chocolate sponge cake layers that are moistened with Kirschwasser and layered with cherries and slathered in whipped cream. If you have a chocolate-covered cherry lover in your life, then maybe it’s time to surprise them. Can you make a Black Forest Cake for a birthday? Of course you could, and you should, but only if you want it to be the best birthday ever. In fact, I can’t think of a better birthday cake than a chocolate, cherry, and whipped cream layer cake, can you? Can you make Black Forest Cake with cherry pie filling? 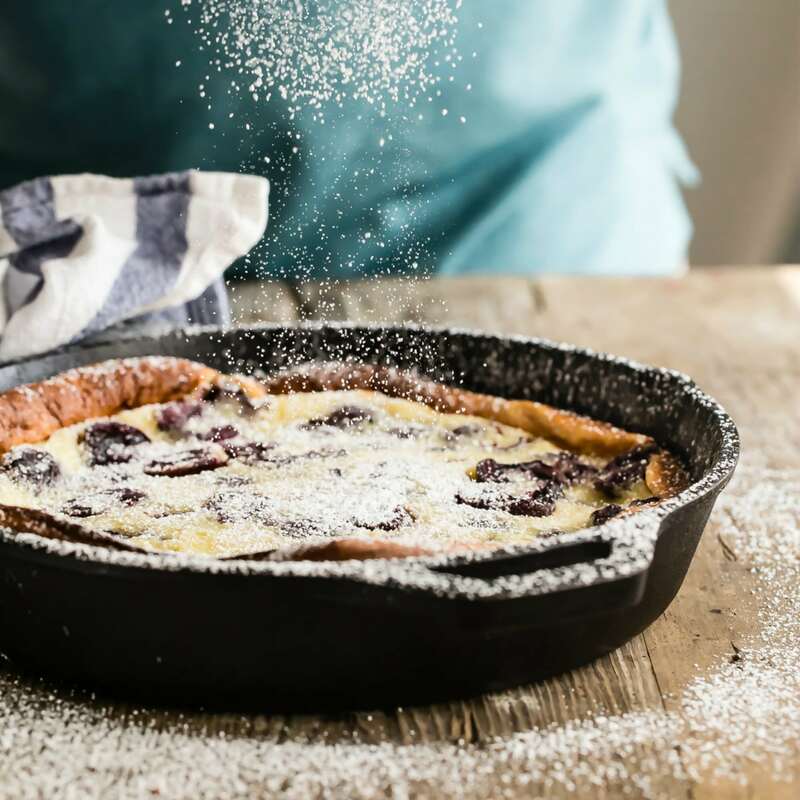 In case cherries are scarce at the store, you can certainly use plain old cherry pie filling, but start with about 1/2 cup filling per layer, otherwise the cake layers may slide around too much when you move it. Also, consider using canned tart cherries from Oregon, which I like so much better. Save the juice for the syrup! Finally, if you really want to take it up a notch, go all out on some fancy Luxardo maraschino cherries, preserved Italian cherries which aren’t anywhere near the ones in a kiddie cocktail. What can be used instead of kirsch? Kirschwasser, or kirsch, is a clear, cherry flavored schnapps from Germany. If you can’t find it cherry brandy works fine, too. Can you make Black Forest Cake without alcohol? While I love the syrup that moistens the cake layers, you can omit the kirsch altogether and add a little more sugar to the syrup. Or you can order a kirsch flavored syrup online that works beautifully without alcohol. 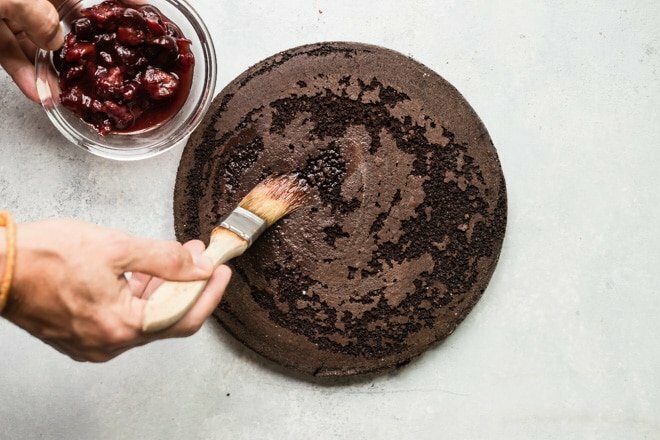 Is it possible to make Black Forest Cake eggless? There are so many eggs in this recipe that to go without them, you’d need to add some leaveners, like baking soda and baking powder. In a large bowl, sift together flour, cocoa powder, baking powder, and baking soda. Add oil, milk, and vanilla, and mix thoroughly. 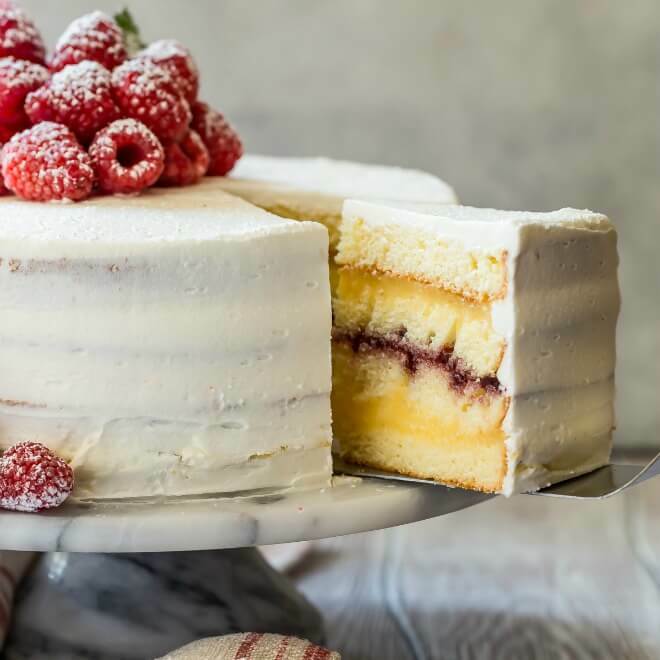 Pour into parchment lined cake pans and bake according to the recipe instructions or until a toothpick inserted into the middle of the cake comes out clean. How long does Black Forest Cake last? Stored in the refrigerator, this cake is best enjoyed the day it’s made, but will be good for 2-3 days after that. 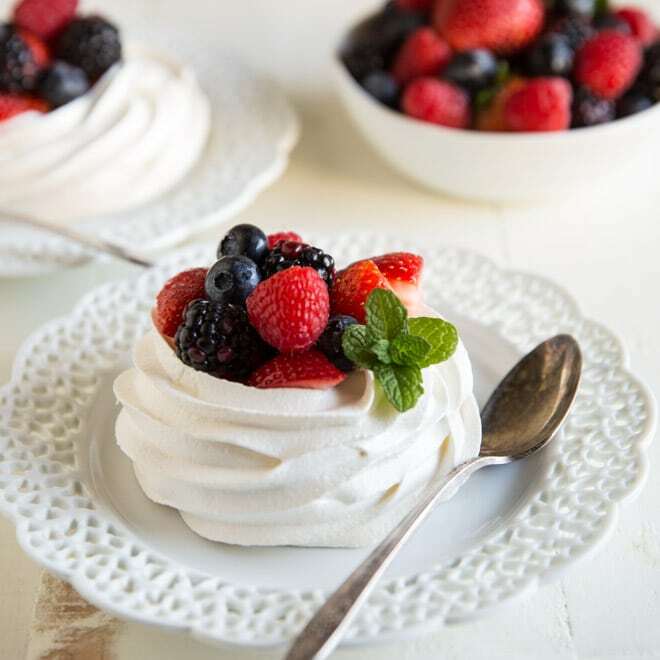 The whipped cream doesn’t have the stabilizers that store bought frosting or buttercream does, so even though it will taste worlds better, unfortunately it won’t have as long of a shelf life. 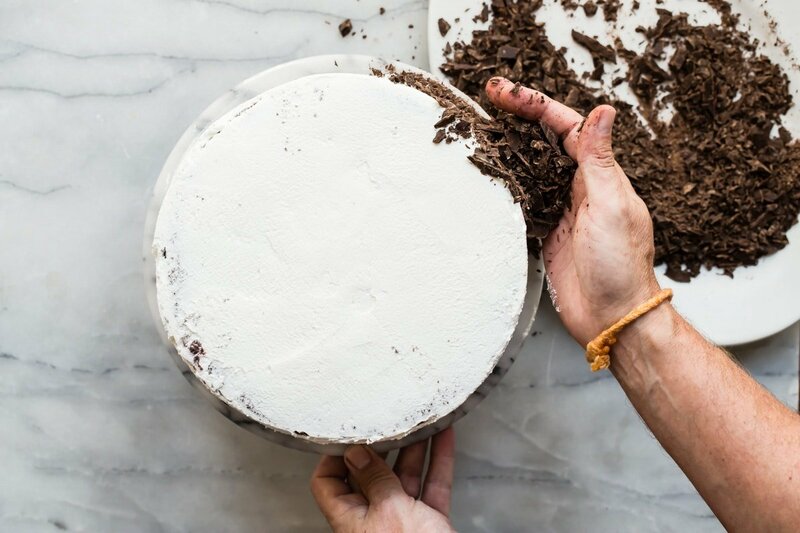 Can you freeze Black Forest Cake? The whole cake wouldn’t freeze very well, but by all means freeze the individual sponge cake layers if you want to make this ahead of time. Double wrap them in plastic wrap once cooled and stick them in the freezer. 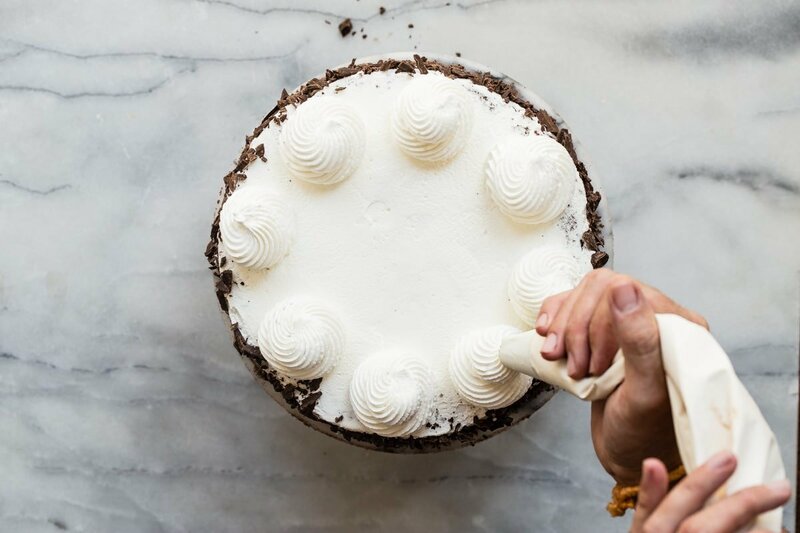 Once frosted, the cake shouldn’t be frozen since it’s made with whipped cream. 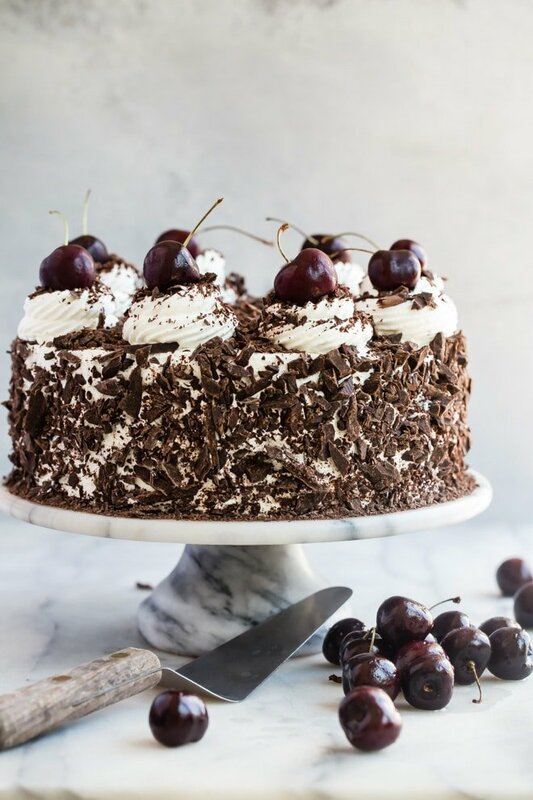 Save this Black Forest Cake to your “Cakes” Pinterest board! Most people just buy Black Forest Cake from a grocery store, but when you bake your own, you get to skip the candied maraschinos and make it just the way you've always wanted it, using fresh cherries, rich cocoa, and real whipped cream. Preheat oven to 350 degrees. Line the bottoms of two 9" round cake pans with parchment. Do not grease the sides of the pans. 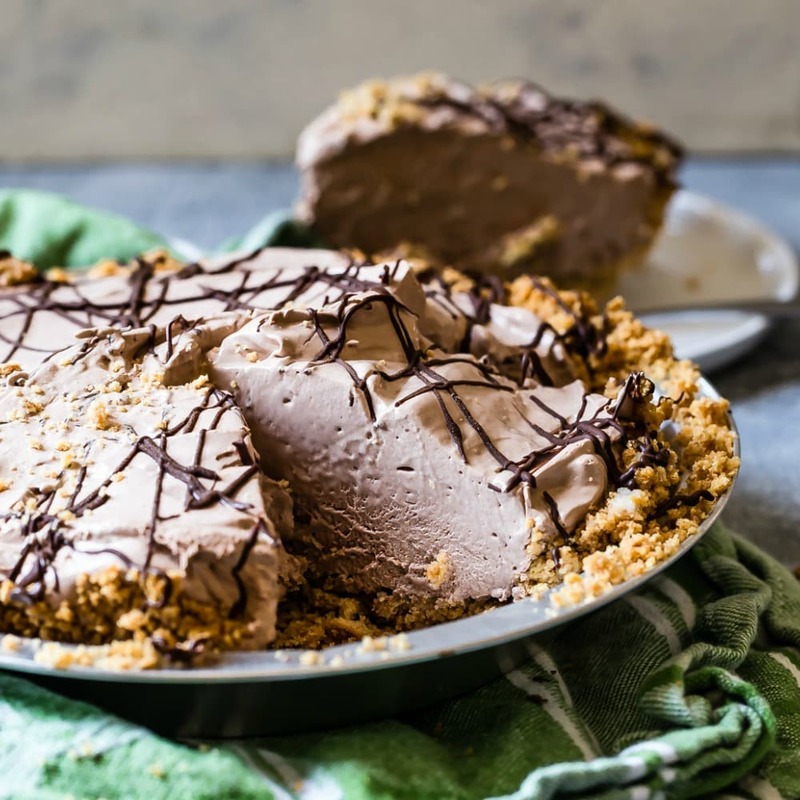 In a medium bowl, whisk together flour and cocoa powder. Set aside. In a standing mixer with the whisk attachment, or with an electric hand mixer, beat eggs on high for 1 minute. With the motor running, gradually add 1 cup sugar and continue beating on high speed a full 8 minutes. The mixture will be thick and fluffy. Using a spatula, add the dry ingredients in 3 batches by hand, mixing just until no streaks remain. Scrape the bottom of the bowl to make sure all ingredients are incorporated. Do not over-mix and deflate the batter. Gently fold in vanilla and butter in a steady stream, folding and scraping as you pour to keep butter from pooling at the bottom. Fold until just incorporated. Once butter is added, the cake must be baked right away or the batter will deflate. 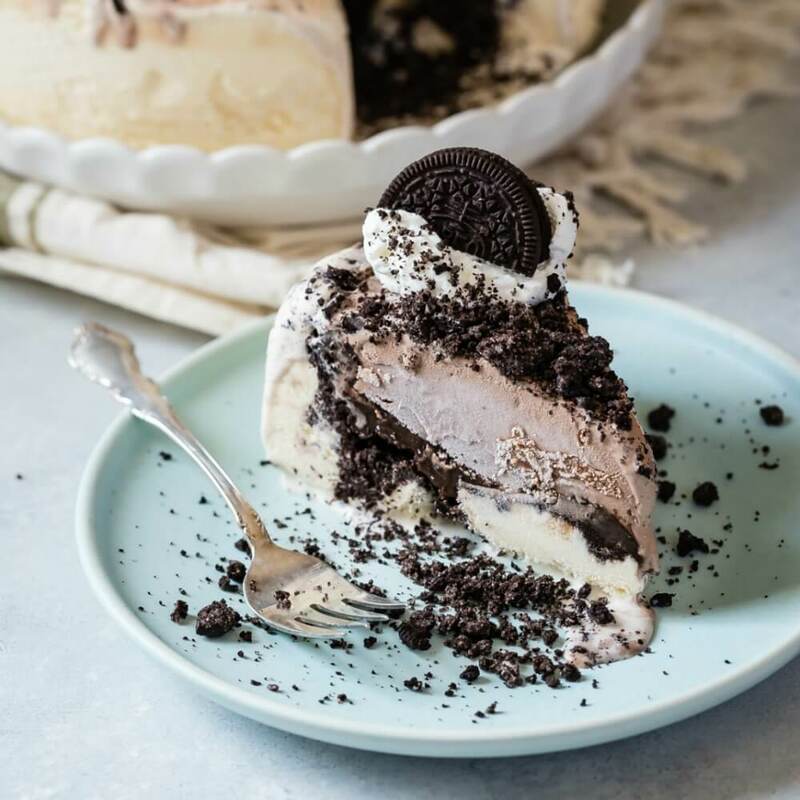 Divide batter equally between two prepared cake pans and bake immediately for 20-25 minutes, or until a toothpick inserted into the center of the cake comes out clean. 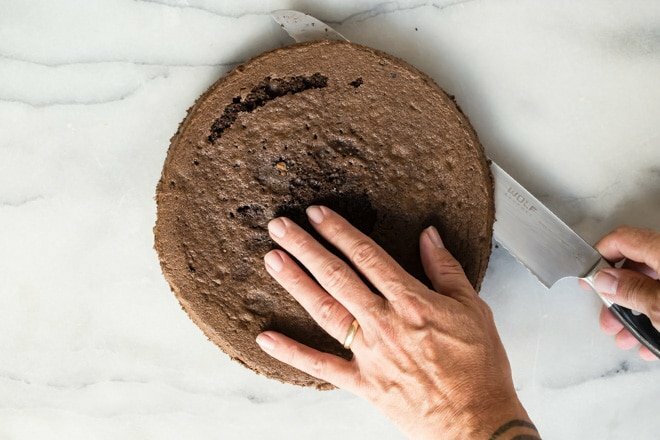 Let cool in pans for 10-15 minutes, then run a thin-edged knife around edges to loosen cake. Invert layers onto a wire rack and remove parchment paper. When cakes cool completely and you're ready to assemble the cake, slice each layer in half horizontally with a long serrated knife. Roughly chop the pitted cherries and place in a medium bowl with 3 tablespoons kirsch. Let sit at room temperature for at least 30 minutes, stirring occasionally. Using a sieve, drain cherries and reserve both cherries and syrup. Add 1/4 cup cold water to the syrup (you should have roughly 1/3 cup of syrup). For best results, freeze the mixing bowl and whisk attachment 15 minutes prior to using. 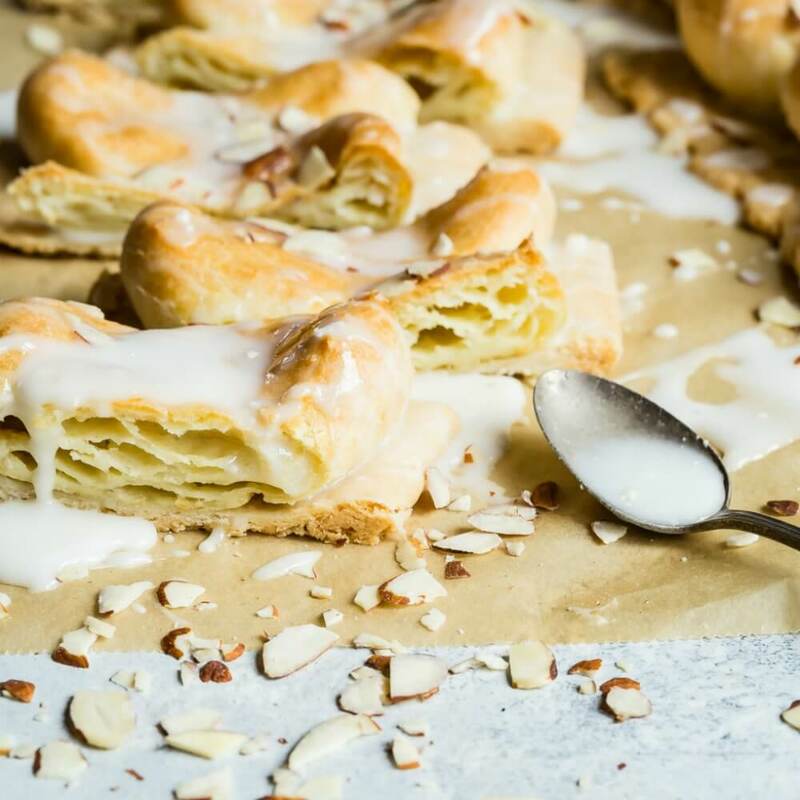 Beat heavy cream with whisk attachment on high speed until soft peaks form, then add powdered sugar and remaining 1 tablespoon kirsch and beat on high until stiff and spreadable, 1-2 minutes. Refrigerate until ready to use. Place first layer on a cake stand and brush with 1/4 of the syrup. Spread 3/4 cup frosting over the top of first layer, then top with 1/3 of the chopped cherries. Repeat with the remaining layers, using the flattest layer to top the cake. Transfer 1 1/2 cups frosting to a pastry bag with a large flower tip and refrigerate until ready to use (try not to handle the bag too much or the cream will soften). Fill the cracks along the sides of cake with frosting then frost the top and sides with remaining frosting. Cover sides and top of cake with chocolate shavings leaving a 1" perimeter on top for piping frosting. Pipe rounds of frosting around the top of the cake and place a whole cherry over each one. 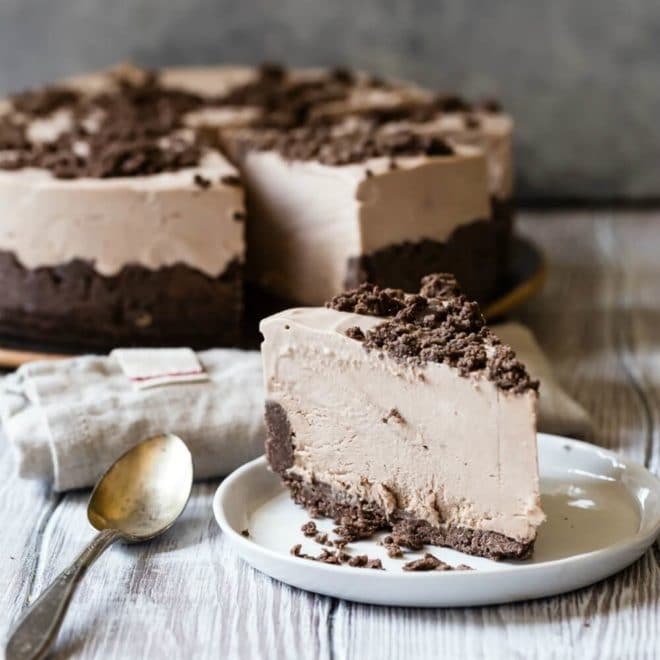 Refrigerate cake for at least 4 hours or overnight before serving. If you want to make a kid-friendly version of this cake, omit the kirsch and add 1 tablespoon sugar to the cherry syrup.